Yes, two-headed sharks are real and scientists keep finding more and more of them. Due to overfishing and more shark species becoming endangered, there aren’t too many sharks left, making genetic mutations much more common. 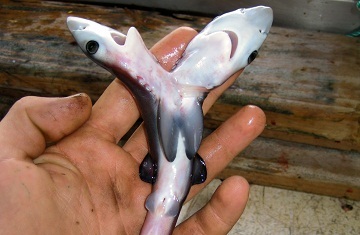 Like the overfishing, two-headed sharks are not new. A fisherman found a two-headed shark embryo in 2008 and in 2013, a gutted Bull shark contained two-headed shark embryos. Adolescent two-headed sharks have been spotted as well. It seems that the blue shark is the most likely species to spawn two-headed sharks. The only way scientists can think to prevent this from becoming more common is to stop overfishing and help save the sharks.